Congrats to all our collaborators at HP for this important win. 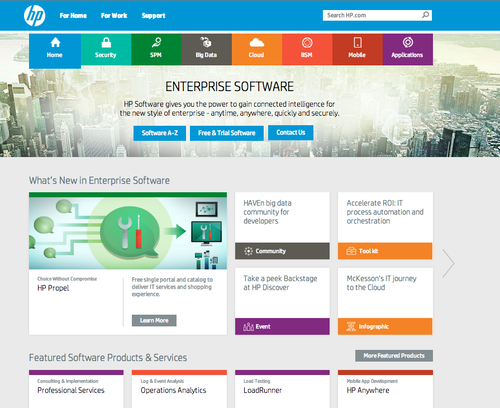 We’ve been working together on this for months – a complete re-architecting of the hp.com software Global Web Experience site. HP has quietly been putting together one of the world’s most robust software offerings, in every major category. They needed a way to give the user that impression at one glance, and let users quickly discover what’s important to them among the products, solutions, services, and content available. The heart of the the experience lies in converting what was a corporate website to an app-store approach. In much the same way you browse for content on an entertainment site, a user can browse the significant HP content. MUH-TAY-ZIK / HOF-FER handled the brand and UX strategy, design, writing, style guide, prototyping, and visual content creation.